Please excuse the funny angle in this picture! 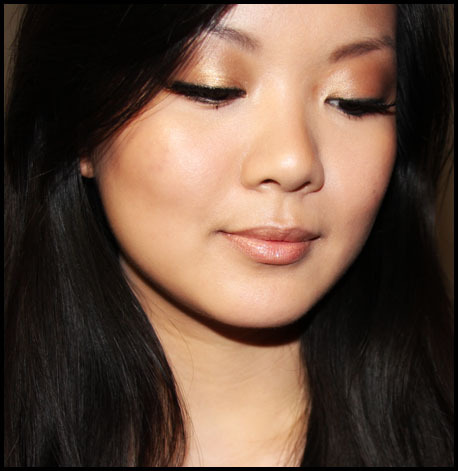 This is a Autumn runway-inspired makeup look, and it features a gold/bronze slightly smoky eye. I am a total sucker for gold, though I don't normally wear it. I hope you enjoy the tutorial! 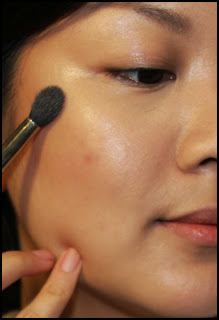 Once you've applied your foundation, dust a matte bronzer or a contour powder underneath your cheekbones, in the hollow of your cheek. 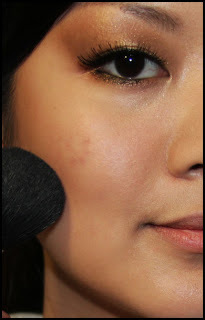 I used an INIKA Blush brush and my Sleek Contour Kit in Medium to do this. Then, using a concealer, clean up underneath your eyes. To make this look pop, take the concealer all the way up to your temples. This provides a good highlight and plays up the bronze really well. 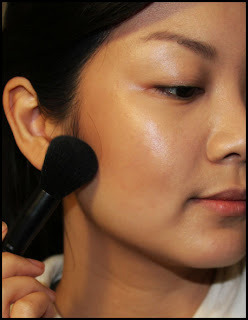 I am using the equivalent of a MAC #224 blending brush, and my Bourjois Healthy Mix Concealer in #52. 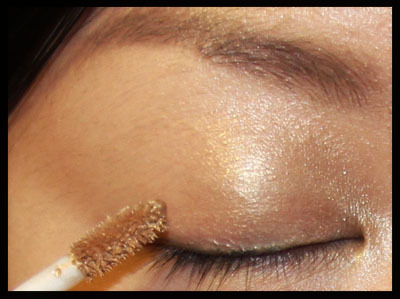 Then, apply a gold cream eyeshadow onto your lid as a base, taking it all the way up to your brow bone. I used JK Jemma Kidd I-Radience Crème Colour in 01 Silk and blended it in with my finger. 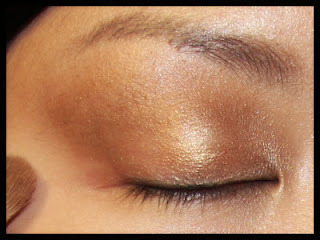 Using a MAC #239 or equivalent, pack a gold eyeshadow into the cream base, but this time, keep it underneath your crease. 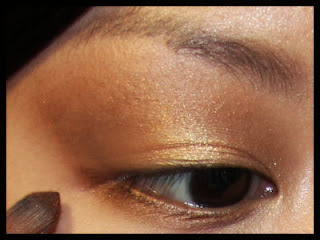 I am using Urban Decay Eyeshadow in Half Baked. Then, using a large pencil brush, (MAC #219 or larger), pop a bronze colour into your crease. I am using a colour from my 88 Neutrals Palette. 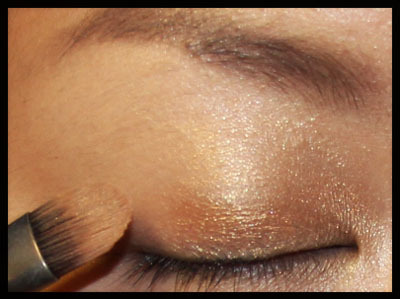 Using a MAC #217 or equivalent, blend the bronze colour into your crease and wing it out at the outer corner of your eye. If you can't be precise with your wing at the outer corner, just use some concealer on a MAC #224 or equivalent and clean up the line to make it sharper. 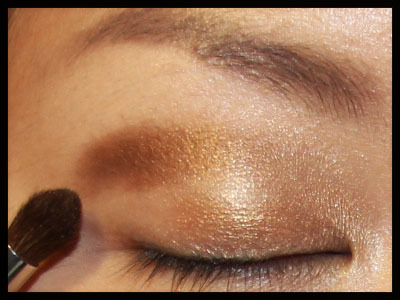 Using a MAC #239 or equivalent, take the same bronze eyeshadow onto your lower lashline and extend the line to meet the bronze eyeshadow on the outer corner of your upper lid. Using a black pencil liner, line the upper and lower lashlines. 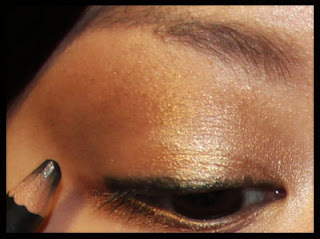 I am using MAC Eye Kohl in Smolder. Keep the eye pencil as close to the lashlines as possible. Then, apply false eyelashes if desired. Apply a rosy pink blush to the apples of your cheeks. Make sure to blend the cheek colour into your contour colour so that there are no obvious lines. 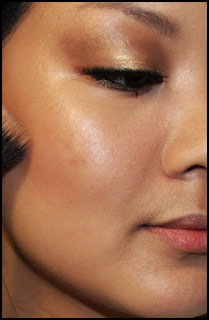 I am using MAC Mineralize Blush in Gentle. Using a stippling brush, apply a gold-based highlighter onto your cheekbones, down the centre of your nose, and on your cupid's bow. I am using INIKA Light Reflect Highlighting Crème. Then, apply a bronze-coloured lipgloss. A great lipgloss would be the Face of Australia Divine Shine Lip Lacquer in Lavish Instinct. I used NYX Mega Shine Lipgloss in Rust.